So, I was having a read through the rules last night and something in particularly struck a chord with the Malefic Daemonology psychic discipline. Each Herald chooses all three powers from Malefic Daemonology, meaning that they have a roughly 62% chance to get any given power. Typically, 11 Heralds will get any specific power and all of them will have the primaris. Step 1: 3x casting of the #1 power, which should eliminate scatter for summoned daemons AND give your army a 2++ thanks to what appears to be a stackable +1 to the daemon's invuln throw. Step 2: 1x casting of basic summoning to get a unit of 10 Pink Horrors. 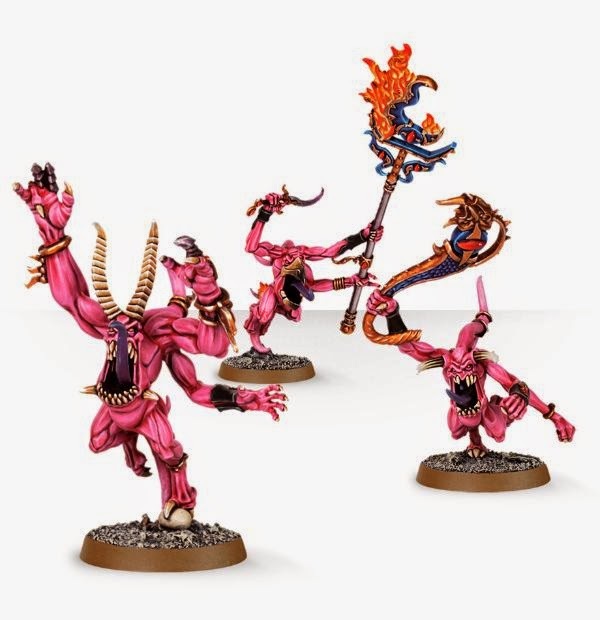 Step 3: As many castings of the #4 power as possible, using Pink Horrors as the sacrifice and summoning more Heralds of Tzeentch. Use the 30 point allowance to spend 25 points and make the Heralds ML2. If you run out of Pink Horrors, go back to Step 2. Step 4: If you run out of castings of #4 and still have Warp Dice available, just summon more Pink Horrors. You will usually get 9-11 new Heralds assuming you use 3 dice per casting. Don't worry too much about Perils of the Warp as it's very unlikely that you will roll poorly and lose your whole unit. Step 1. Summon as many Greater Daemons of Khorne (Bloodthirster Apocalypse) as you can and sit back to watch the fun. Use your remaining Warp Dice to complete the Turn 1 routine. I'm showing that if nothing really bad happens on your opponent's first turn, you should be able to summon around 6 Bloodthirsters on turns 2. I don't see why wouldn't be legal. Please leave comments if you can see any issues.